How Did I End Up Here? Trust. The journey that led me to our apple orchard was a leap of faith and trust. One that I resisted for many, many years. I lived in New Jersey almost my whole life, up until recently. The oldest of six children, there was an 11 year difference between myself and my youngest brother. I made a conscious decision at 17 to go to college in my home state, only applying to two colleges. I never even visited the colleges I applied to, I just knew I wanted to be close to home so as my little brothers and sisters grew up, we would know each other. I always thought of New Jersey as my home. I had no intention of moving. I thought I’d buy a house, renovate it, buy a bigger house, have kids, then get an even bigger house, and so on. After buying a starter home, renovating it, and selling it to move into a bigger one, I would spend four hours each week cleaning it spotless when there was only two of us living there. Then… I had kids. A statement I’m sure many of you can relate to! My children have been one of the most profound changes in my life. One I will no doubt have many more tales to write about. The unexpected nature of my children, especially my first, threw everything I knew into a blender and mixed it all up until nothing I had known previously was recognizable. My oldest started his schooling at a highly academic preschool and kindergarten, where it became obvious that it was not a good fit. He would never be the student that could sit down and turn to page 47 and do his work quietly. At the end of his kindergarten year, I was introduced, rather serendipitously, to the philosophy of The Free School. I read everything I could about it and fell in love with the dual tenants of individual freedom and responsibility. The year my children went to school there was actually more freeing for me. It ushered me along the process of shedding my need for perfection and learning to trust; trust that everything will turn out okay. It was at this point, that I was in a place where I was willing to seek change. My husband and I put our house, located a busy highway, on the market where it miraculously sold in less than two weeks. It was a sign that we were moving in a new direction that was just waiting for us. Somehow I felt at ease with my decision, although leaving family, friends and an incredible job that offered me all the flexibility and security I could ever ask for, was not easy. Now having sold our home and putting most everything we owned in storage, we bought a small tow-behind camper and pointed our compass north. New England in general for me always had a quality about it I can only explain as the feeling that I could breath again. Maine was where my husband most identified as home and so we started touring the state looking for that magic combination where we all felt a fit. A school for our two boys was our first priority, one that placed more emphasis on learning from experience rather than test outcomes. We thought, we’d find a school and then a home would follow, but when we looked at a school we liked, the area wasn’t resonating with us. All the while, Bryan and I were dreaming up our wish list for a home: wide plank floors, lots of acreage, a big barn, an older home with character. 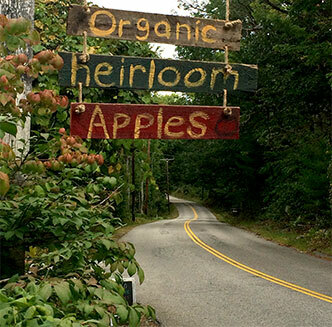 Then, when we were visiting a school, within a few minutes of meeting the science teacher she asked us, “You don’t want to live on a 26-acre organic apple orchard with an old farmhouse, do you?” My eyes lit up! It sounded perfect. 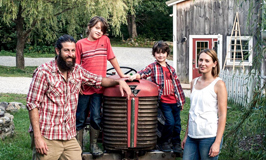 Bryan had kept an organic garden for fun, not nearly the experience you’d need to run a 700+ tree orchard organically, but it ignited an underlying passion that started us on our journey at the orchard. The whole process has been a leap of faith and trust. It’s a beautiful reminder that we can put out to the universe what we want and then let go and just trust that everything will happen as it should. If it’s not exactly what we wanted, it serves as a lesson just waiting for us to discover. Blessings to you as you discover your own personal path and trust in it. Father’s Day has come and gone, but a father’s love remains. Year after year, no matter how far the distance, be it time or space, a father’s love transcends and transforms. So many people truly adore their fathers, and I am one of them. 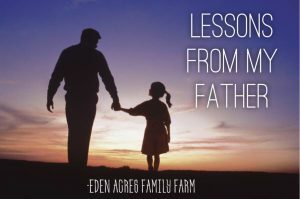 My father is my teacher in this life. Though I didn’t always appreciate it, as I work to develop a business of my own, I am reminded of how truly forward thinking he is. He’s progressive, always with goals, ever changing and evolving goals that shift and grow as he does. He visualizes his goals, embodies them, and then lets the cards fall where they may. There’s that trust element that so many of us forget when we work to manifest our heart’s desires. Having that trust is so magical because I can see in him that he doesn’t stress! He is super successful, which may appear to an outsider that he’s just lucky. And really, he is, but his luck is of his own accord. It’s not because he was born into privilege or handed success on a silver plate. He simply believes he will be successful; in his mind, in his being, and in his actions. His energy is magnetic, uplifting, and contagious. I look to his life as an example of how I want to be. Working and enjoying life at the same time. Even the mundane, he makes fun. He always encouraged me in my writing, once suggesting I attend law school which I knew wasn’t my passion, but encouraged my confidence in writing nonetheless. I never thought anything would come of my writing, more of a diary style of prose than anything else, but I have now started my own blog that will relate to my passions of food (mostly chocolate and desserts! 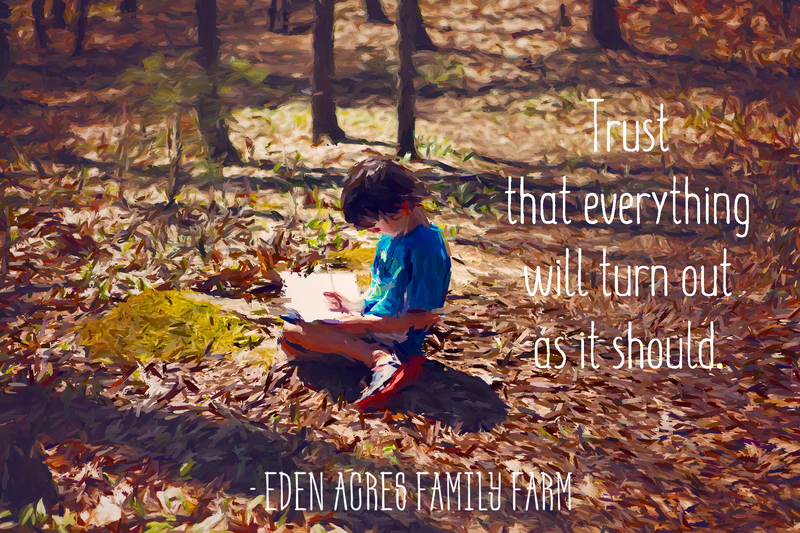 ), family, spirituality, and our newly evolving business, Eden Acres Family Farm. Thank you for joining me on my journey. I look forward to your comments and connecting with you.